We love us some good salad recipes! They are great for lunch or dinner and full of veggies. 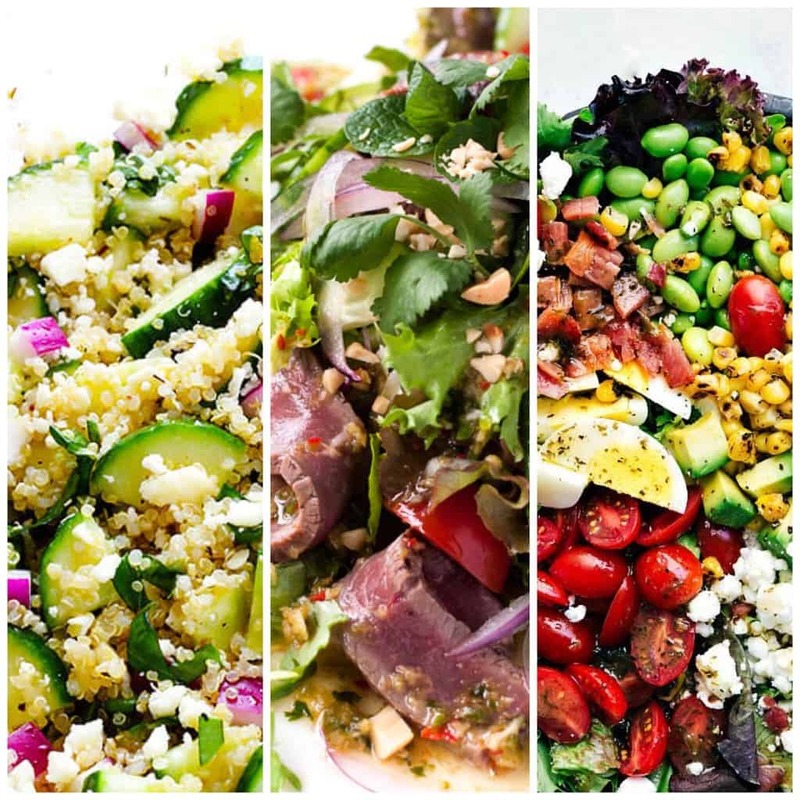 These are chicken salads, hearty salads, quinoa and even sweet salads with fruit! We love some good salad recipes here! The flavors are so vibrant and energizing, the colors are crazy eye candy, and they’re good for you to boot. Plus, little to no cooking? I’m won over. I feel like I’m constantly trying to make sure my diet is as healthy as it should be and tasty salad recipes are my favorite way to do that. We’ve rounded up some of our favorite salad recipes to share with you. Salads can sometimes seem boring, and not substantial enough, they just get a bad rap. When building a salad, the most important thing is to decide what you want the backbone or base of your salad to be! Having a good base will ensure your salad is substantial, but still fill you up with all of those good things like nutrients and vitamins that your body craves. We’ve separated this roundup into 5 bases to help you pick the one best for you and your salad bowl. With salads, the possibilities are really endless. This Honey Mustard Chopped Chicken Sandwich from How Sweet Eats sounds so creative and delish. This Chinese Chicken Salad with homemade Oriental salad dressing is unbelievable amazing! So quick and easy to throw together. How does a BLTA Chicken Salad Lettuce Wraps strike you? Cooking Classy has really outdone herself this time, these wraps are anything but flimsy, but full of so much good stuff and I mean with something that’s based on a BLT can you really go wrong. I just can’t get over how good Thai food is. The flavors in Thai salad recipes are so bright and colorful and anything but boring. This Low Carb Pad Thai Salad from the Londoner looks so fresh and tasty. Our Blackened Chicken Caesar Salad with Crispy Onions is everything you want a salad to be. A chicken caesar salad is pretty classic, but the blackened chicken and crispy onions take it over the top. This beautiful BBQ Chicken Salad is so delicious, although warning: it may cause you to want summer to move to somewhere you can grill outside all year long so you can enjoy it any time. Can you believe my husband had never had fruit in a savory salad before we met? He was clearly missing out. This Peach Salad with Grilled Basil Chicken from Cooking Classy is one you have to try. Peach and basil go so well together and the chicken is the perfect canvas. Herbs are secret weapons of the salad recipes world, they make it easy to add powerful punches of flavor without too much salt or fat. This Tomato Basil and Chickpea Salad looks so fresh and tasty and full of that herby goodness. Cinco de Mayo anyone?? 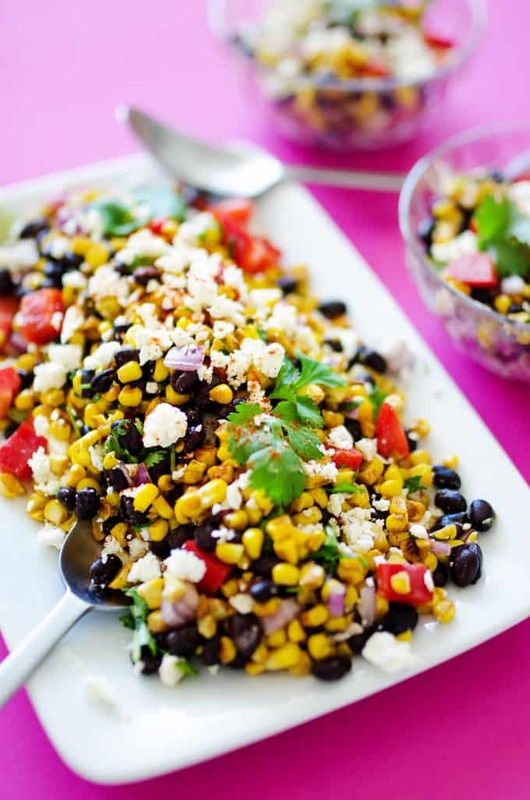 This Mexican Street Corn Salad from Live Eat Learn is the best way to get your Mexican food fix and is full of so many different delicious veggies. You have got to see this salad. I can’t seem to get over all the fresh colors, and I can only imagine that this Spring Salad from Proud Italian Cook tastes better than it looks. Our Family Favorite Salad Dressing is, of course, a classic around here, and a great addition to any salad. Let’s look at something a little different with this Vietnamese Noodle Salad from Foodie Crush. The rice noodles are such a cool way to mix things up and still make a salad that is really filling. I swear I could eat it right off the screen. 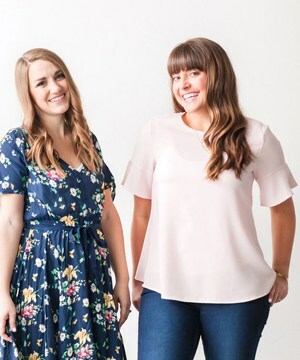 Do you have a spiralizer you’ve been dying to play with? Salad recipes are a great way to get some milage out of it! This Spiralized Greek Salad is full of so many delicious veggies and doesn’t skimp on flavor. Again, one of the best things about fresh salad recipes is cramming them full of fresh herbs that explode with flavor! This Persian Chopped Salad from Heather Christo makes use of that fact in the best way. Doesn’t a good salad just make you want to change your life? I just want to go out and eliminate anything unhealthy from my life and change the world! Maybe this Berry Orange Spinach Salad from Yay for Food probably won’t do all that, but it still sounds amazing. You know what goes really good with fruit? Cheese. If you bread it and fry it, you won’t believe how it can level up your salad game. This Crispy Goat Cheese Avocado Salad from Whitney Bond may not be the healthiest salad on the list, but come on. Fried Cheese. We’re not robots. MORE. FRIED. CHEESE. 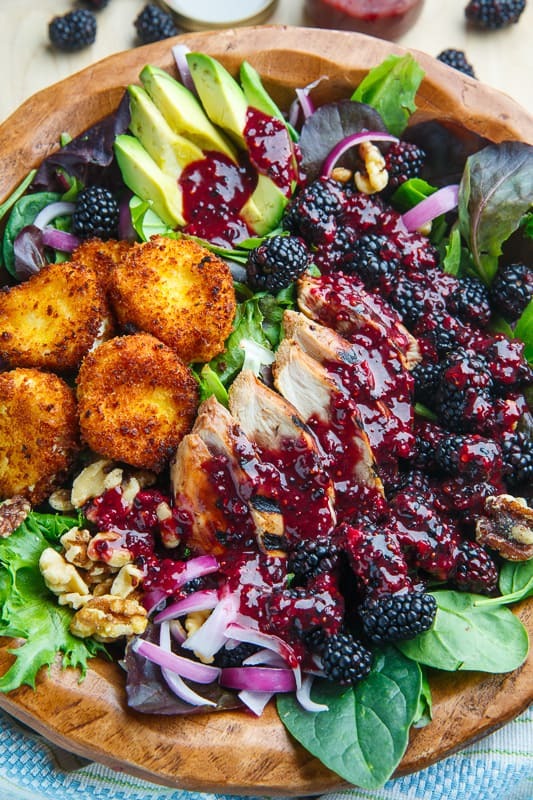 This Blackberry Balsamic Grilled Chicken Salad from Closet Cooking gives you everything you ever wanted in a salad. The dressing is a gorgeous deep purple and makes it look so appealing. Mandarin oranges are amazing in salad recipes. They’re like little pockets of juicy sweetness. This Asian Sesame Chicken Salad exploits that in the best way possible. I only just started making watermelon salad recipes this year, and I can’t believe I’ve lived this long with out them. They are one of life’s joys. 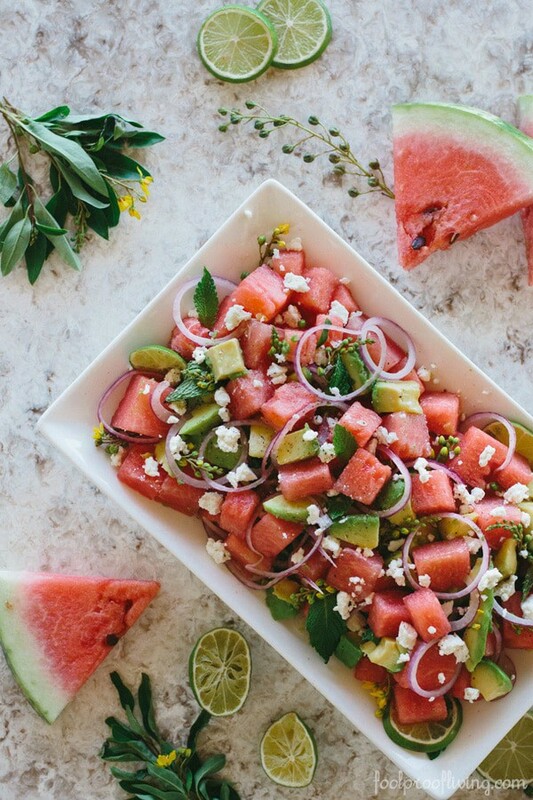 This Watermelon, Avocado and Mint Salad with Feta Cheese looks absolutely amazing. Pomegranates are basically rubies you can eat. This Pear and Pomegranate Salad from House of Yumm is crazy beautiful. A good salad doesn’t have to be complicated. Just some fresh yummy ingredients and a simple dressing can work wonders, just like with this Black and Blue Spring Salad from Iowa Girl Eats. Our Spinach Poppyseed Salad is really a classic and the perfect blend of salty and sweet. Quinoa is the unsung hero of salad recipes. It’s packed with protein and soaks up salad dressing so it can pretty much taste however you want. Doesn’t this salad just sound like your body will thank you for eating it? This 7 shades of Green Spring Quinoa Salad from Maria Ushakova could not be more perfect. Quinoa is everywhere right now, and with good reason! It’s such a great way to bulk up a salad if you want to cut back on your meat. This Pesto Zucchini Corn and Quinoa Salad from Closet Cooking looks like it’s got all the right moves. 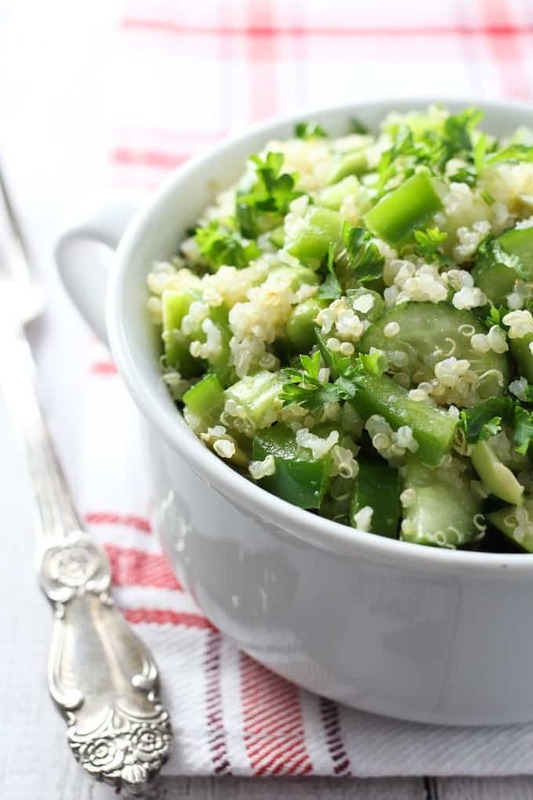 This Cucumber Quinoa Salad from Gimme Some Oven looks like a delectable combination of quinoa and cucumbers, onions and cheese. Amazing. Standing ovation. Salad recipes can be really anything you want, so this last category is a list of how to use different meats or bases. Really there are no rules, so take a minute to think about what salad you dream about, and make that! There is just something about smoked salmon that makes me want to scream YAAASSSSS. This Smoked Salmon Salad from Sprinkles and Sprouts is next on my list to try. Ok, this is the last Vietnamese salad I promise, they’re just so yummy! I mean they are always just so full of color!! This Vietnamese Shrimp Salad looks like it’s done everything right. I think I normally think of Cobb salad as one of the most boring salad recipes in existence, but this Cobb Salad from Chelsea’s Messy Apron is anything but boring! It uses hardboiled eggs as a protein base, which are so cheap, and easy to prepare. I dont want to put too much pressure on this salad, but it’s legitimately the most delicious thing I have ever put in my mouth. I never thought I would be one of those people who chooses to eat a salad on her birthday, but this has been my meal of choice for the past two years. This Thai Beef Salad from Recipe Tin Eats is that good. This California Steak Salad with Chimichurri from Joyful Healthy Eats is a great way to take your tastebuds on vacation without even leaving home. This salad sounds like the recipe equivalent of an hour of early morning yoga. It looks and feels just as good. 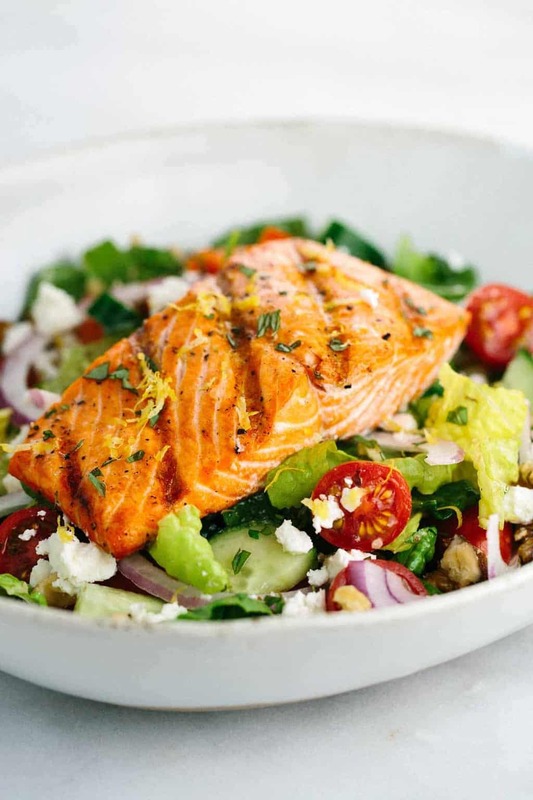 This Grilled Salmon Greek Salad from Jessica Gavin is making my mouth water like crazy. The Honey Lemon Vinaigrette on Peach Bacon Salad looks absolutely divine. We’ve got Rock Recipes to thank for this one. Bacon is like fairy dust for salads, you really can’t go wrong. I hope your perspective of what a salad can be has changed as much as mine has! We love having salads for dinner and they are such a great way of vamping up your healthy eating habits. As you can see there really are limitless possibilities. Did we cover all of the salad bases or do you have anything to add? It’s totally possible, salads are that awesome.